He was referring to various incidents of bigotry in the United States since the election of Donald Trump as well as the controversy over Steve Bannon who has been running the very nasty "Breitbart News" since Breitbart's 2012 death. Bannon says the publication is: "virulently anti-establishment, particularly 'anti-' the permanent political class." However, it publishes material which seems to me and others to be misogynist, xenophobic, racist and white nationalist. In other words really stupid and often disgusting. 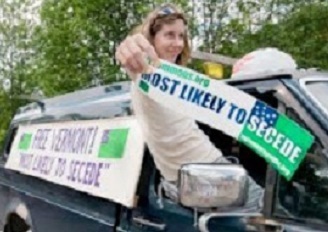 Here is a February 2008 blog entry from my former blog "Secede and Survive" at VermontCommons. It has now transitioned to VermontIndependent.org. Called "Secession and Sectarianism" it is about the dangers of this topic in organizing secessionist movements. Secessionists face the problem of sectarianism both from the most rabid unionists who oppose secession on ideological grounds and, contrarily, from those who support it as a means of advancing and even imposing their sectarian agenda, be it racial, ethnic, religious or ideological. Concern about distrust, bigotry, sectarianism exploding into separatist violence is legitimate because throughout history such divisions have erupted into violence, sometimes among ever growing numbers of factions. Recent examples are sectarian divisions in Yugoslavia throughout the 1990s, in Rwanda in 1994 and especially in Iraq after the 2003 United States invasion. So it is very important to build a secessionist movement that recognizes and has strategies for dealing with sectarianism. Sectarianism is always a threat. Even the smallest states in the United States will have a variety of political, economic, regional, religious, ethnic, racial and other groups envisioning very different alternative institutional structures. It’s certainly possible that as secession catches on even Vermont could see splits among anti-capitalist anarchist, right wing Christian separatists, laissez-fair middle class libertarians, gated community Republicans, and whatever other local Vermont groups and networks might exist. And if the most aggressive and violent males in each faction have their way, it could turn bloody.The bigger the state, the more the sources of conflict. Current political structures dampen and contain such conflict; in “democracies” through a democratic facade that masks special interest rule and in autocracies through brutal military and police repression. At the same time, elites also may pursue deliberate divide and conquer strategies to keep different subgroups from uniting against them, including employing propagandists and provocateurs to stir up trouble among different groups. However, once the state structure is weakened or destroyed - usually by its own failings, the most ruthless sectarians can organize armed groups to grab territory and resources and drive out long time residents. And this may be one of the legitimate concerns of those who question the League of the South and the Second Vermont Republic’s relation to them. Is the League of the South a group that just wants to maintain a certain heritage among its members, without fomenting bigotry and hate against other groups? Or is it, like some claim, a “racist hate group.” (It has issued a statement that racism is un-Christian.) Does it just want freedom from state interference in its family or community life? Or does it want to impose its culture, including Christian culture, on those who do not share it - or drive them out if they refuse to submit? Of course, given the opportunities that secession can provide for mischief, the same can be asked of left wing anti-capitalist anarchists or groups like the North Star Republic communists who want to smash any private enterprise they consider to be too big - and for some that includes private home ownership and Mom and Pop stores. And then there are radical environmentalists who might try to impose an impoverished environmentalist lifestyle on others. I’ve done my own heated expose on the violent extremists in such movements in my e-book THE RETURN OF STREET FIGHTING MAN. And questions about bigotry and sectarianism can be asked of some LaRaza members who might want to drive all the “gringos” out of re-taken territories in the South West. Or of black separatist groups like the Nation of Islam. All of these groups should make it clear they do not intend to impose their values on others. The declarations of intent of the most sectarian secessionists frighten people into believing all secessionists have extremist political, economic or cultural views they intend to impose on everyone else. That’s why wise secessionists, and the various networks and organizations they create, should stress their goal is giving people choice, including, but not limited to, creating homogeneous communities. We do not want to give the impression our goal is to replace today’s many diverse and multi-cultural communities with a “diversity” of homogeneous ones when it is not. Diversity is what makes people and cultures stronger. I explored the solution to these problems previously in my first Vermont Commons blog entry “Issues in Secession.” It details the necessity for emphasis on community-based, not big state secession; libertarian tolerance, voluntarism and minimal government; clear principles of nonviolent conflict resolution, bills of rights and consensus-oriented and direct democracy decision making.